Keah Brown is an American writer working on a book called The Pretty One, which is a collection of essays about living as a disabled woman of colour in a white, abled world. 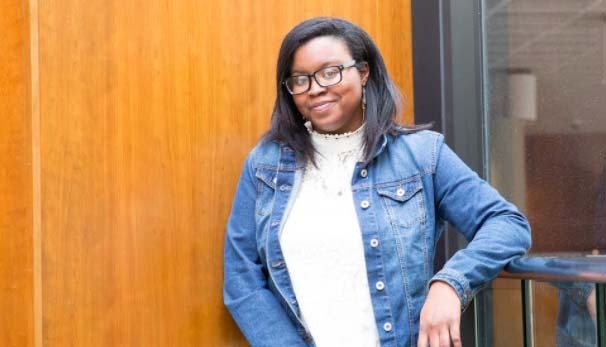 Keah studied journalism at the State University of New York at Fredonia and lives in Lockport, N.Y. She’s a senior entertainment writer at ClicheMag.com, and her essays have been published in The Rumpus, Harper’s, Teen Vogue and Lenny Letter. I first heard about Keah a year ago when she launched a photo campaign with the hashtag #disabledandcute on Twitter and it went viral. I wanted to talk to her about the impact of racism and ableism when she was growing up. BLOOM: How did your experiences as a black, disabled woman figure into your desire to write? Keah Brown: Writing is something I’ve always done. Even in secret, when I was growing up, I had little notebooks that I’d write songs in. And the songs would become poems, and the poems became stories, and it was a natural progression. When you grow up not seeing yourself represented in any form of media outside exploitative telethons, you get the urge to say ‘Hey, that’s not how any of this works.’ I’m here to tell my story because I don’t want to be forgotten, or be assumed to be a certain way when I’m not. The Pretty One is about our need to change the culture and the ideas that shape the way we see disability, because they’re harmful. The Pretty One is about joy, and about finding a way to the other side of what is self-hate or poor self-esteem. The narratives we usually see are about people with disabilities who hate their bodies. We often see that in movies, where a disabled character wants to die. I wanted to showcase how someone who feels those things comes out of it—and the work that takes—and the process of getting to be a person who is very much joyful and happy and full, in a way she never was before. Obviously there’s going to be a bit of heartbreak and loss and grief. But ultimately The Pretty One is about joy. BLOOM: So the book is written as a series of essays? Keah Brown: It’s a collection of 13 personal essays, at this point. I'm not sure if that will change. We’re shooting for a release date of spring 2019. BLOOM: You’ve written about having cerebral palsy. How does it affect you? Keah Brown: I have hemiplegia, so it affects my right side. I’m able to walk, but I need to take breaks, and I get aching limbs and arms and hips. But at this point, I don’t use a mobility aid. BLOOM: Last year you wrote a beautiful piece on Roxane Gay’s book Hunger in The Rumpus. It begins like this: ‘There’s a moment in every day where I think of my younger self—the fifteen-year-old me, the sixteen-year-old me, and the twenty-year-old me who prayed morning, noon, and night to be rid of my body. When I was younger, my scars, bruises, bent fingers, limping leg, and crooked lips disgusted me.’ In the essay, you write about your desire for invisibility when kids would ask you what was wrong with your body. Keah Brown: Because I wasn’t surrounded by many other disabled people, let alone kids, I saw my disability as this thing to run away from, or to try to pretend that it wasn’t there. I had a very happy childhood from kindergarten to Grade 5, and Grade 6 was when I realized I had a disability. With my other siblings—I have a twin sister and a brother—they’re able-bodied and my mom never treated me any different. Whatever they got I got, and we never talked about my disability in terms of it being this difference and that difference was bad. Then when I got to middle school and kids made fun of me in the cafeteria, it kind of stuck with me. If someone made fun of this thing that was different, then it must be bad. So I spent a lot of time wishing to be invisible and wishing that I would wake up in another body. I felt I was being punished in the body I had. I wanted to be just like everyone else and to blend in. I was tired of people asking questions and staring at me. BLOOM: What would you tell other children whose differences make them want to disappear? Keah Brown: The best advice I can give is that they are who they are, and all that they are is enough. It’s not only enough, but it’s beautiful and worthwhile, and their bodies tell a story. It doesn’t matter if they don’t look like a certain person, or look a certain way. What matters is that they figure out who they are, and celebrate that. That is the person they're stuck with for the rest of their life, so it’s important that they learn to love that person. BLOOM: You’ve written about how when children don’t fit conventional European white standards of beauty, there’s almost an expectation that they should hate their body. Keah Brown: Absolutely. There’s this idea that if you’re different you should feel bad about being ‘other’ and breaking the mould. When you do that, people don’t know what to do with you. They assume you don't know what to do with yourself, and you should be uncomfortable, because they’re uncomfortable. To those of us who are different, our differences make us unique. Those unique things make us who we are, and who we are is enough. BLOOM: You created the Twitter campaign with the #disabledandcute hashtag. What did you hope to achieve with that? Keah Brown: I didn’t hope to achieve anything. I started it for myself and posted four pictures and the hashtag, just to celebrate myself and other disabled men, women and non-binary people. I wanted to say ‘Hey, I finally feel good in my body and you should too.’ Then I left Twitter and went back to an essay I was writing on a deadline. When I came back, #disabledandcute was trending. By the end of the week I was interviewed by a bunch of different publications, and I learned that #disabledandcute went viral and spread from Twitter to Facebook to Instagram and Tumblr. I began it to try to celebrate myself, but it became a thing where all disabled people could celebrate themselves. That’s what I’m grateful for. It will be a year this Monday that I posted it. BLOOM: As a child, how did you experience racism and ableism. Keah Brown: I didn’t really know what they were as a child. People would speak to me really slowly and would be condescending, as if they assumed I didn’t understand them. I was never ashamed of being black and in terms of racism, we were sheltered from most of that in my childhood. There were small comments that people made. But never anything that I really had to internalize or keep to myself, in the way I had to with things people said about my disability. Disability as a 'bad' thing outweighed my blackness. I was always very proud of being black and confident that being black was something beautiful. I grew up in a household of other black people who loved themselves, so I loved myself too. Our blackness was something we had in common, whereas disability was the thing we didn’t share. I felt disability separated me from my twin sister. I just wanted to be like her and look more like her. I wanted all of these things I thought she could have that I couldn’t have. 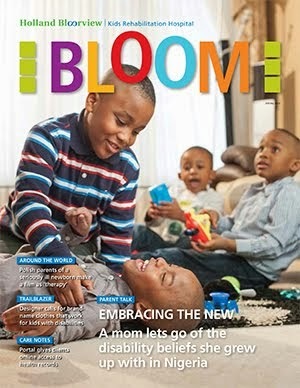 BLOOM: Was disability accepted in your family? Keah Brown: I did feel accepted. I have a humongous family and they were very much always ‘That’s just Keah. It’s who she is.’ My disability wasn’t like a thing that people were weird about. It was what it was. It wasn’t something we addressed or ignored, or pretended that it wasn’t there. It was seen as an aspect of me, but it wasn’t all that I was. BLOOM: Did you ever feel your disability was marginalized in the black community? Keah Brown: Not really. The majority of the comments I received as a child—and even now—come from white people. People of colour tend not to say much to me about my disability, unless they know me. The stares and the mocking and the talking slowly is a thing a lot of white people have done. Most of the rough experiences I’ve had have been from white people. BLOOM: You’ve written about lack of accessibility. What message does it convey to people with disabilities? Keah Brown: In my freshman year in high school I had a big surgery, and then I had to come back a year later and have a plate taken out. That’s when I realized how inaccessible the building was. There was a kid named Mason who used a wheelchair and I used a walker, and we had to go to the back of the school just to get into it. The elevators were really slow and it took us longer to get everywhere. These are all things abled people take for granted—that they can get to and from places without any problem. Today, it's still a really big issue for me. I can’t get down the stairs safely in a mall. Going up the stairs is fine, but coming down I have to reach my left hand over my right arm to hold the rail. What was good in my childhood was that there were always people around to help me before I knew I needed help. They helped me figure out ways to trick an inaccessible system. That's how I figured out how to put my left hand over my right one to get down stairs. Or if I’m standing for a long time, I shift my weight from left to right so that my whole right side isn’t aching by the time I move again. I spend a lot of time in my house, which is very accessible, and in my room where I write. It’s a single level house with a basement that's easy for me to get down to. I’m able to figure out how to navigate in my own house. The issue starts when I get to public places and they don’t have the same accommodations. BLOOM: I read that you went to a largely white high school and college. How did that affect you? Keah Brown: I think what I know now I couldn’t articulate then. When you don’t see enough people who look like you during the day, you start to retreat into yourself. Even though there’s nothing wrong with my black skin, you keep some things to yourself, because you’re trying to navigate a world that's vastly different from the one you knew before. In a primarily white institution, I was taught mainly about white writers and journalists. I had to look outside the classroom for writers of colour, and to find heroes of my own who looked like me. The way I handled those experiences was to lean on other people of colour who could commiserate with me. They understood what it’s like to experience multiple micro-aggressions from other students. BLOOM: Were these people outside the school? Keah Brown: No, they were the few other black students. We’d acknowledge each other with a head nod and eat lunch together and go to the movies and hang out. BLOOM: You said that your book is about the process of getting to a point where you love your body and celebrate it. How did you get to the other side? Keah Brown: Girl, a lot of tears and definitely counselling, and trying. I tried for the first time. What I’ve found is that sometimes you want something but you don’t really work for it. I had to really confront my own problems with disability, and not just my own disability. I had to confront my own internalized ableism and views about what disability is and what it can be in order to make myself a better person. I got tired of living my life like it was the world’s worst punishment. I got tired of getting up and feeling like ‘I hate you, you’re ugly,’ and insulting a body that was doing the best it could to keep me alive. I thought I was giving myself these insults to prepare myself for when other people said them. But it never made me feel better. I had to actively try to be kinder to myself. I found something I liked physically and mentally about myself, and worked every single day at it. Self-love and self-worth is an everyday practice. This is not a one-time thing. It’s a constant. BLOOM: You mentioned counselling was helpful. Was it hard to find a therapist who understood about disability? Keah Brown: I went to counselling at college because it was free. The first counsellor, while I’m sure she was a lovely person, didn’t work out. She treated me as though my self-hatred was something I should just be over. That’s an issue that sometimes happens when a person doesn’t have physical disabilities. They don’t feel comfortable around disability, so they want you to be over it, and not talk about it. The second counsellor I had was brilliant and did a really good job. Counselling helps. I also had to do a lot of internalized work where I acknowledged that I’d met these disabled people online that I love, and they mean the world to me, and it was time to start looking at myself with that love. Throughout my time of self-discovery I also read books and found fictional characters to fall in love with and grow with. I found bits and pieces of things they did that I thought I could emulate. Keah, thanks for your amazing writing, for talking about intersectionality, and for #disabledandcute. I'm so glad you brought all of this to the Twitterverse! I urge you to connect with these women. I saw your story a about a year ago, I think, and added you as one of the links of power on the Cerebral Palsy Power page of the site. It was built to shed light on the need for research into the coexistence of CP & the aging process....I've been surprised a lot!